There are no upcoming College Tours planned. Contact us today to schedule a tour. To provide African-American public school students the opportunity to visit colleges and universities and excite them about attending college. The majority of African-American public school students do not have the opportunity to visit a college or university and be exposed to college life. 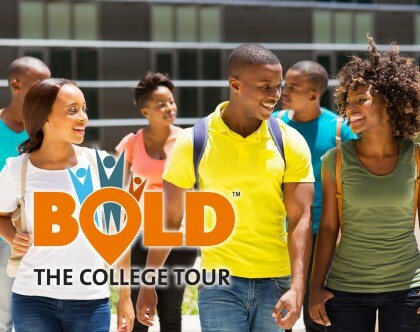 BOLD THE COLLEGE TOUR™ will provide that experience .The theme of the tours: SEEING IS BELIEVING. We want the students to SEE and be exposed to college life and BELIEVE that they too can attend one of the great colleges and universities in America. The tours will be sponsored in partnership with community based organizations and churches. The tours will be six days and will take place during spring break and summer vacation. This traveling educational and cultural experience will be a bus tour to colleges and universities in selected markets. The schools will be both Historically Black colleges as well as majority schools. During the college visits the students will have the opportunity to see and experience cultural sites/events in the each city.